This is my submission to this week's Souper Sundays, hosted by Deb from Kahakai Kitchen and My Legume Love Affair, hosted by Susan from The Well-Seasoned Cook. 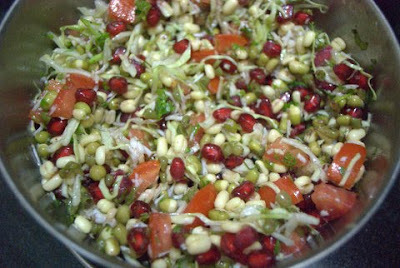 I need to eat more sprouts and this salad looks like a colorful and healthy way to do that. ;-) Thanks for sending it to Souper Sundays. Hope to have you back! This dish looks so lively and fresh! I'm just starting to see pomegranates in my markets. Thanks, Megha, for your great MLLA recipe! Wow - what a colourful salad! 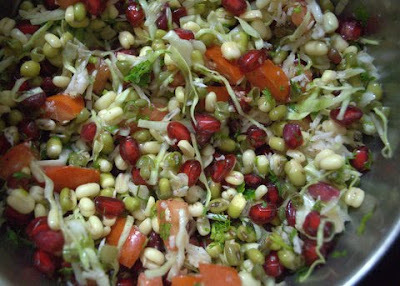 I have never even thought to sprout beans and this really makes me want to try! Thanks for sharing, Megha!